My Movies can recognise TV series and episodes in a filesystem through the import folder and folder monitoring functionality. However for this to work, some conventions for the folder structure and file naming needs to be followed. The structures and naming formats that My Movies support are the ones that are often used on the Internet. Both the import folder and folder monitoring functionality needs a specification of a root folder in which the subfolders represents the TV series. The naming of the subfolders must be the titles of the series, as these names are used for matching the serie against the databases. 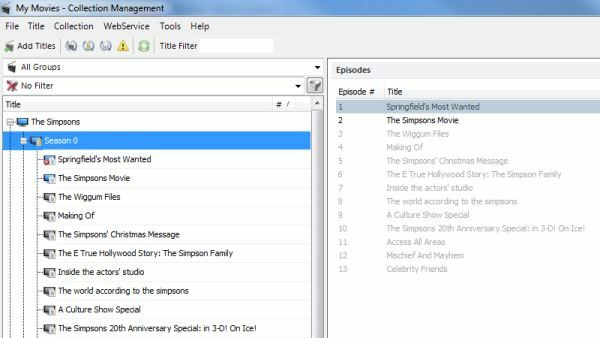 Any folders that are not directly subfolders of the root folder are not recognised as individual TV Series, they are however still traversed for episode files. The following example shows a folder stucture and the folders that are recognised as TV Series. (TV) Is the root folder specified to the import folder / folder monitoring functionality. (24) This folder is seen as a TV serie folder, and the name of the folder is used for the serie name. (Season 1) This folder is ignored, but video files in it are matched as episode files if possible. (Cheers) This folder is seen as a TV serie folder, the folder name is used for the serie name. (Wonderfalls) This folder is seen as a TV serie folder, the folder name is used for the serie name. The files for the TV serie can be directly in the series root folder (the one with the serie name), or in any of its subfolders. The important part is the naming of the video files. The files should always include a number for the season and for the episode. The following rules tells how this numbering can be used. The season is indicated by an "s" followed by digits and the episode with an "e" followed by digits. Either the season and episode are written right after each other or they are seperated by "." or "-". "Another Simpsons Clip Show S06e03.mkv"
"s6-e5 - Sideshow Bob Roberts.mkv"
"The Simpsons S6.e4 - Itchy Scratchy Land.mkv"
The season and episode are specified as above, but with the season and episode in square brackets , and with an "_" as seperator. The season is specified as a number followed by an "x" and then the episode number. "6x1 - Bart of Darkness.mkv"
The season is specified as a number directly followed by the episode number. The episode number must be in two digits. "The Simpsons 602 - Lisas Rival.mkv"
For multiple episodes in one file the format must be as follows. The season is indicated by an "s" followed by digits and then the first episode with an "e" followed by digits, and then a "-" and an "e" followed by the digits for the last episode. Files with an extention that is a valid video format are recognised by My Movies, this includes files registered in Windows as perceivedType=video, and files configured in monitoring configuration as known video file extentions. The "mkv" file extention in the above examples are just an example of a recognized file type. A lot of TV series have speciel episodes such as trailers, prequels, and extra. These should be named as being in season 0. The episode numbers can be hard to guess, but when a serie is added/imported in My Movies you can see the episode numbers in My Movies Collection Management, where all the known episodes for the serie are listed.